Those who know me very well know that I am an organized nuthead. Although my life, my home, and my work are still not at its most orderly, it is very much on its way! 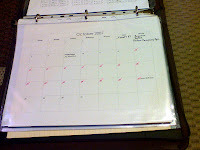 My biggest challenge this year was finding that perfect planner/organizer that will seamlessly get my life in order. I am a new wife who needs to attend to her husband's needs (most of them food-related! ), I am an employee with very crucial responsibilities, and most of all I am our Father's daughter who finds joy in serving Him and spending time with Him. The very overpriced (did you really think it was free?) Starbucks planner used to be enough during the days when I was single. 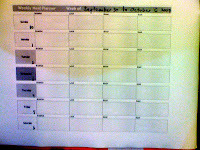 Now being happily married means having to juggle a crazy schedule. My husband gets invited to a lot of social gatherings and other activities. 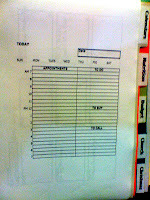 Merging his schedule with mine was the biggest married challenge, I must say! And then there are other matters that need my attention like menu planning, grocery shopping, calorie counting, budgeting, church matters, goal projections, work to do's and Christmas too! Although I find delight at the though of tackling these matters, I was overwhelmed at the thought of keeping different notepads or planner just to ensure everything is attended to. 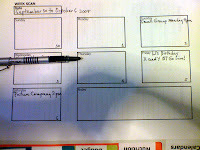 I tried searching for a trusty planner in every office supply shop I could find. All I came across was the same old notebooks with calendars and some space for notes. I started reading Donna Otto's book "Get More Done In Less Time," -- a great home organization resource. 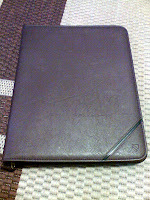 I picked it up at the resource center of Victory Ortigas. The first couple of chapters talked about how she had the same problem as mine. Her solution was, make her own planner! As I read through the book, she guided me into making my own personalized forms that according to the demands of my life. This is the first page containing important personal information just in case I lose it. Blurred on purpose of course! My year-at-a-glance page. So that I can immediately see which date belongs to what day. And see which ones are available. My very important TODAY PAGE. 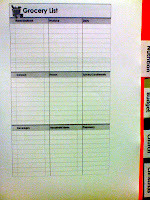 You will that there is a space for appointments and to-do, to-buy, and to-call lists. I make sure that this gets filled out before I go to bed. I feel less overwhelmed in the morning. 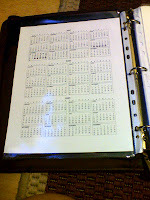 You will also see how I made my tabs: Calendars, Nutrition, Budget, Church and Christmas. My weekly meal planner. Got to feed the hubby stuff he likes and stuff that are good for him. Here is my grocery shopping list form. 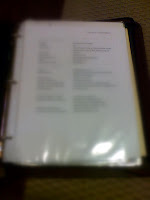 Easy to take out from the binder and bring with me to the grocery. The trick is do different forms on a trial and error basis on your computer. Do not get frustrated when it doesn't serve its purpose right away. It takes some time to customize forms that perfectly fits your lifestyle. I strongly suggest that you read the book because it has tons of sample forms there. You can copy the forms until you feel the need to modify. If you would like to take a look at my own forms, leave a comment with your e-mail address.